Federico García Lorca Granada-Jaén Airport, also known as Granada Airport, is the airport serving the province and city of Granada, in Spain. Once you arrive at Granada Airport (GRX) your private taxi driver will greet you at the assigned Meeting Point, and will be carrying a sign with your name on it. The driver tracks flight arrivals to Granada airport and is notified of any delays using a special mobile application, so you will always be greeted at the right terminal at the right time. While travelling from the airport to Granada city center or any other destination in Andalucia, the driver will give you tips and suggestions on what to do in the course of your stay. All drivers are carefully selected, have local knowledge and speak English. Everything is arranged so that you can enjoy the relaxed and comfortable trip from Granada airport to the city center or your holiday hotel. Hand-picked & trained local drivers, with local information about the Alhambra, etc. The WelcomePickups Granada airport transfer services can meet the needs of both small and large groups of travellers. Both a sedan car and a minivan vehicle are available as options. For up to 4 passengers, a comfortable sedan vehicle will be sufficient for your transfer from the airport to Granada city centre, or any other destinations in Andalucia. In the event that you are travelling with a large group of people (up to 8), a minivan can easily handle your ride in the most convenient way. However, if you wish, your Granada airport taxi transfer is just the start. 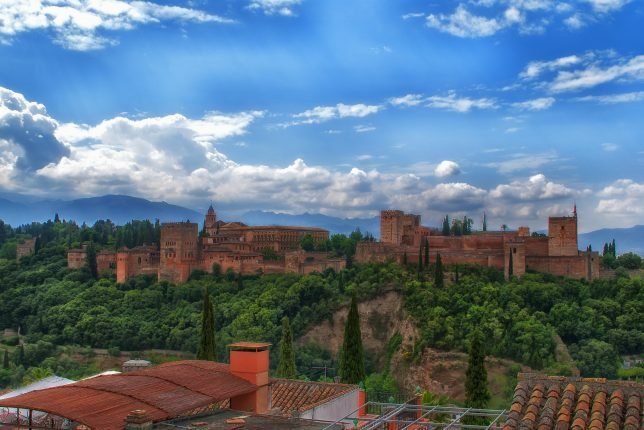 You can also book in advance tickets for the best known attractions of Granada, such as the Alhambra, the Generalife Gardens, the moorish quarter, Federico Garcia Lorca’s house, and more. Your tickets will be given to you by your driver in order to avoid the big line ups at the ticket counters. Brilliant service! Made things a lot easier. Driver on both runs were very nice. Gave us lots of ideas on places to visit and showed us things on the way to hotel. Gave us a bag, map and water which was welcomed. Highly recommend Welcome for transfers. I will be telling everyone I know going to Athens to avail of the service. Welcome Pickups made our arrival in a foreign country, after a long flight, very easy! We were greeted by a driver with our name on the sign. He spoke fluent english, gave us tips while visiting Prague, and drove us safely to our hotel. We were picked up from the Athens airport by Kostas and taken to the Olympic Marina where we picked up my aunt. Kostas waited a couple of hours for us to get ready to take her back to Athens where we were spending a couple days before our sailing trip. He was great, very friendly, offered us cold bottles of water every time we got in the car and snacks. He also had charging stations and wifi in the car for us. He really wanted to make sure we had a great experience, going above and beyond to show us interesting things on our way. The next day we booked him for an all day tour to Delphi, where he included a few interesting stops where he said we could “take the most awesome photo ever.” Again he offered us snacks and cold water throughout the day. He truly went above and beyond! I’d give him 6 stars if I could.When we got back from the sailing trip the next week, Kostas was unavailable to pick us up from the Marina, so we booked with Welcome and were assigned Andreas. He was very nice and very professional. He communicated via WhatsApp very quickly so we had no problems meeting up with him at the Marina and being taken to our hotel in Athens. We need another transfer the next day from Athens to the airport, and Andreas made that appointment very easy to handle. When we decided we wanted to go a few hours earlier than planned, again he responded very quickly by WhatsApp and got the adjustment all taken care of very easily. Highly recommend him as well. Get your low-cost transfer price quote now and enjoy your trip to Granada! Photo of Granada, courtesy of Almogavar, Flickr.